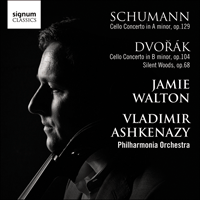 Jamie Walton is joined by the Philharmonia Orchestra under the baton of their conductor laureate Vladimir Ashkenazy for this new concerto recording of concertos and orchestral works by Dvorák and Schumann. Jamie Walton has proved himself as a leading light in UK's musical life; as a performer in his widely praised concerto and sonata recordings, and as a festival director in his work as founder of the North York Moors Festival, which was shortlisted for an RPS Award in 2011. After a promising beginning in the later 18th century at the hands of such masters as Haydn and Boccherini, the cello concerto as a genre languished for many decades. Mozart wrote nothing of consequence for solo cello; Beethoven, his great sonatas for the instrument notwithstanding, scrupled to set it against an orchestra except in the modest role it takes in his Triple Concerto. And though important composers continued to write important cello sonatas, very few concertos were written until the middle of the 19th century, and none of note have survived in the repertoire, though those of the respected Hamburg composer and cello virtuoso Bernhard Romberg (1767-1841), whose cello works were studied by Brahms, are probably worth investigation. The reason for the genre falling into eclipse has much to do with the growth in size and dynamic power of the orchestra, to a point where it was considered that the cello, with its modest tone and predominantly middle-to-low tessitura, would be unable to project itself effectively against the powerful, colourful massed voices of the Romantic orchestra. It was, therefore, rather surprising that that arch-Romantic Robert Schumann should have decided, in 1850, to essay his Cello Concerto in A minor, Op 129. Schumann had started learning the cello himself in the 1830s and he had written a number of instrumental duos in which the cello is an alternative to horn or oboe or viola; but after the success of his first work specifically for cello and piano, the Fünf Stücke im Volkston of 1849, he may have felt encouraged to try the larger medium of cello and orchestra. As originally drafted (by October 1850—it was Schumann’s first large-scale composition after he took up his duties as Municipal Music Director in Düsseldorf that autumn) the work was entitled Konzertstück, presumably because of its comparatively modest scale and the way the three movements are run together into a fantasia-like continuum with a network of subtle thematic cross-references. Schumann may have intended the work for Christian Reimers, the principal cellist of the Düsseldorf orchestra, but though he rehearsed the work with Reimers in March 1851 no public performance ensued and an informal run-through with another cellist in 1852 had no more definite outcome. On the other hand these sessions gave Schumann grounds for plentiful revision, especially in balancing the orchestral scoring against the solo part, which was incorporated in the score published—now as ‘Concerto for cello with orchestral accompaniment’—in 1854. By this time Schumann’s reason had given way and he was confined in the sanatorium at Endenich where he died two years later. Meanwhile the Cello Concerto remained unperformed, only receiving its public premiere in Leipzig in June 1860 at the hands of the distinguished cellist Ludwig Ebert, and it did not secure its place in the repertoire until the early 20th century, thanks largely to the championship of Pablo Casals. The published title reflects the fact that Schumann keeps the cello centre-stage, and the orchestra often in the background, so that the soloist is able to project their lyrically expressive part without having to force their tone. In fact Schumann’s orchestration is notably discreet, especially in his sparing use of trumpets and drums. Three introductory wind chords (themselves delineating an important motif) are all the preparation necessary for the soloist’s superb first-subject melody, an archetypal flight of romantic fancy, at once ardent and melancholic. A more resolute orchestral transition leads to the musing second subject in C major, which contains within itself another three-note motif which soon gains independent existence and, along with another figure in terse triplet rhythm, plays a considerable role in the development. In the course of this the first subject is heard on the horn, in keys (such as F sharp minor) distant enough to have been hazardous indeed had Schumann not known he could rely on the comparatively recently-invented valve horn. The recapitulation is regular but flows seamlessly into the F major slow movement, a lyrical song without words in Schumann’s most dreamily expressive vein. The gentlest pizzicato accompaniment backs the solo cello, which in the middle-section embellishes the melody in plangent double-stopped thirds. The orchestra then alludes to the work’s opening subject, and the cello breaks into an agitated recitative leading to the determined finale. This seeks to invest its resolute, vaguely march-like opening figure with a propulsive determination that Schumann’s solo writing, always prone to introspection, never quite allows. Reminiscences of the first movement continue to infiltrate the discourse, and the movement culminates in a cadenza with discreet orchestral accompaniment (itself an innovation) which favours the cello’s lower strings, before coming to a brusque conclusion. While Schumann’s Cello Concerto waited a long time to be recognized at its merits, Antonín Dvořák’s Cello Concerto in B minor, Op 104, was hailed from the first as a remarkable achievement, and has always remained one of the best-loved works in the entire genre. Dvořák wrote four concertos in all, but it is his last, this Cello Concerto of 1894–5, which is incomparably the best known. His very first essay in the concerto genre was also for cello—a Concerto in A major, sketched in 1865, but which remained unorchestrated and unknown until 1929, when it appeared in a somewhat speculative orchestral edition by Günther Raphael. While this remains simply a curiosity, his Piano Concerto of 1876 and the Violin Concerto of 1880 are works of considerable quality which, though comparatively rare visitors to the concert platform, are accorded the respect due to their mastery. But it is the B minor Cello Concerto that audiences have taken to their hearts. It was composed in the USA, between November 1894 and February 1895, during Dvořák’s third and last season as Director of the National Conservatory in New York: some writers have seen it as his ‘Farewell to America’ although, as with his Symphony From the New World, its ambience is predominantly Czech. He intended the work for the cellist of the Czech String Quartet, Hanuš Wihan, with whom he had made a concert tour of Bohemia in the winter of 1891–2; and Wihan, to whom the Concerto was eventually dedicated, made a few suggestions for modifications to the solo part, though these were confined to the last movement. Dvořák rejected Wihan’s attempted addition of a virtuoso cadenza in the finale, however, and indeed after he returned to Bohemia in the spring of 1895 he made some substantial revisions to the piece which were occasioned by his feelings about the fact that his sister-in-law Josefína Kounicová, with whom he had once been in love, was seriously ill. Josefína died in May 1895, and in the following weeks Dvořák composed the extended coda of the concerto. It is sometimes stated—and may be true—that Dvořák was spurred to write his concerto after hearing a performance in New York of the Cello Concerto No 2 by the Irish-born composer and conductor Victor Herbert (it was in the same concert with From the New World); his own concerto does not employ the single-movement form that Herbert had used, but it looks like he may have been impressed by Herbert’s resourceful use of the cello’s high register, and of the trombones to support the solo instrument. It is well known that Johannes Brahms, who had been a friend and to some extent a mentor to Dvořák since the 1870s, is said to have remarked on reading the score, ‘Why didn’t I know that it was possible to write a cello concerto like this? If I’d known, I would have written one myself long ago!’ He had in fact already declared himself impressed, in similar terms, by the cello concerto of Robert Volkmann (which has maintained a slight foothold in the repertoire) and that of Carl Florian Eckert (which has not); but Dvořák’s concerto was clearly superior to either of those in technique and inspiration. The perennial problem of a cello concerto, namely the balance between the soloist and the orchestra, seems merely to have stimulated his orchestral invention, and resulted in striking combinations of the cello with, especially, solo wind instruments. Unlike in his Violin Concerto, Dvořák begins the Cello Concerto with a full orchestral exposition, with two clearly-defined subject-groups: the first begun by the clarinets at the very outset in a resolute march tempo, the second a gorgeously expressive horn melody in D major. Throughout the entire concerto Dvořák shows himself at his most inventive, continually introducing new incidental ideas and at the same time treating the main themes with notable freedom, varying them at each appearance. A high-spirited if rather perfunctory theme for full orchestra (which will never be heard again) rounds off the exposition, and the cello enters with quasi improvisando variants of the first theme that lead in time to a beautiful restatement of the second, for a full counter-exposition. After a grandiose concluding theme in the orchestra the development begins with a dramatic transformation of the first subject and a modulation to the distant tonality of A flat minor—where, over soft and mysterious string tremolandi, the cello sadly sings a melancholic cantabile version of the opening theme, slowed down to half its original speed. Flute and oboe further develop the tune over rippling arpeggios from the soloist; and the music starts to drift back towards the tonic B minor; a low and ominous drum-roll galvanizes the soloist into a thrilling bravura passage that culminates in a chromatic take-off in octaves that deposits us right into the recapitulation—which does not begin with the expected opening theme, already fully treated in the development, but with the lyrical second theme, now stated beneficently by the full orchestra. Despite the length and relaxed, lyric nature of his materials, Dvořák has just brilliantly short-circuited the demands of orthodox sonata form by effectively collapsing development and recapitulation into one another. Eventually the opening theme returns in full grandeur on the orchestra and then for the soloist, and this superb movement comes to an end with a brief, triumphant coda. The Adagio man non troppo slow movement, in G major, is an expansive lyrical inspiration of the highest poetic quality, full of Slavonic atmosphere. The idyllic theme of the first section is heard on the clarinet before the soloist takes it over, and here again Dvořák’s invention is so rich and profuse that the subsidiary figures which grow out of the theme are almost as important as the subject itself. The dream-like mood is shattered by a dramatic middle section in G minor: this is founded on the opening phrase of a song, Kéžduch můj sám (‘Leave me alone’), to a poem by the German poetess Ottilie Malybrok-Stieler, which Dvořák had set in 1887 as one of his Four Songs, Op 82. (This whole episode is one of Dvořák’s later revisions: the song was a favourite of Josefína Kounicová.) After variants on the song-melody the opening subject returns in harmony on three horns, over rhythmic figures in the low strings that ominously suggest a funeral march; it then becomes the material for a short quasi-cadenza for the soloist, with woodwind accompaniment, leading to a gentle coda in which the theme of the dramatic episode is transformed by a flute into an ending of quiet pastoral serenity. The hints of march-music that occur in both the previous movements are decisively confirmed by the finale, a rondo that opens with a march-like tread and whose main theme is unmistakably an emphatic and ebullient march-tune. Over the basic march-rhythm Dvořák once again, with extraordinary generosity of invention, brings a host of attractive subsidiary ideas into being. The first episode features a fleeting appearance of double-stopping in the cello’s high register; the second begins with a passionate subsidiary theme in F sharp that leads to a slower, dolce theme made up of broken phrases. A broad, lyrical Moderato theme in G major forms the other principal episode. Generally speaking each episode is longer than the one before, as Dvořák enjoys spinning a web of romantic reverie. Eventually we return to the marching rondo theme, in B major, and the form of the finale would seem to have run its course—but instead Dvořák, as if reluctant to take his leave, launches into what Donald Tovey described as ‘a glorious series of epilogues’. This—partly the music that Dvořák incorporated into the work in memory of Josefína—is in effect a long coda in which the song theme from the slow movement is heard again, and then the Concerto’s opening theme returns serenely on the clarinets. The trombones, in solemn mood, at last remind us of the rondo theme’s opening figure, and the music swiftly pulls itself together for a final blaze of pugnacious energy. Dvořák’s few remaining cello works are comparative miniatures, and the only one to have attained secure repertoire status is the lyrical Silent Woods, Op 68 No 5. This is an orchestral version of a movement from Dvořák’s suite for piano duet From Bohemia’s Woods, first composed in 1881. Ten years later, Dvořák was touring Bohemia playing trios with a violinist and with Hanuš Wihan, who would be the destined soloist of the Cello Concerto, and he realized he had no solo cello piece to show off Wihan’s talents. Dvořák therefore composed a short G minor Rondo for cello and piano and made a similar arrangement of Silent Woods, which he went on to orchestrate in 1893. Essentially this is a tone-picture of nature at dusk, with a gorgeous tune which, effective enough in its original form, seems to have been fated from the beginning to be played on the cello.